Allison Tait has blogged her third-class school photo over at Life In A Pink Fibro and invited others to do the same. I wrote a blog called “Who Were You in Primary School” a few months back, so I’m reblogging it in her honour. “OK, technically this is a photo of me in infants school. I went a bit manky after that and I’m too shy to share. 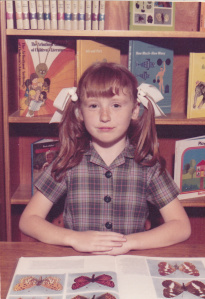 I was the girl with plastic bobbles and ribbons in my pigtails (until I was ooooh, 15). I had freckles and a nose that “matured” before the rest of my face. I hid my bananas behind a sink in the classroom after a boy called me a “gorilla” once. No-one suspected it was me because I was the teacher’s-pet type. In fourth grade, I was christened the “walking dictionary” – when the teacher was busy, he directed all enquiries to me (I peaked early). In fifth grade, I pretended to read Runyon On Broadway to impress the head librarian, Mrs Thurlow (who – ’70s scandal – remarried and became Mrs Arca De Pane, or something exotic like that). God knows what Runyon was doing in a primary school library. It was beyond me, but faking interest afforded many library privileges and hushed speculation about my superior intellect. I pulled the wool over my sixth grade teacher’s eyes too. He taught me Jabberwocky and I repaid him by breaking into his storeroom to steal the results of my (and the rest of the class’s) IQ tests. I knew it was wrong, but I just had to KNOW. I’d been hoping for something MENSA-worthy after all those Reader’s Digest tests. Sadly, no. I remember the girl who sat next to me in class smelling different. She was Greek so I’m thinking it was garlic. I didn’t know what garlic was. I ate Vegemite sandwiches (or, gasp, peanut butter) for lunch every day (with the occasional Smiths chip roll from the canteen), chops with three veg for dinner from Monday to Thursday, fish fingers on Friday, KFC on Saturday and savoury mince on Sunday. My nickname was “House on Fire”. Last name House, hair colour red … geddit? My name inspired endless jokes like “If you’re a house, where are your doors and windows?” Bwahahaha. I walked to school every morning. It wasn’t a short trip. No namby-pamby drop-offs at the school gates like the Sprogs get every day. No molly-coddly trumpet lessons, art classes, keyboard lessons or gymnastics either. I did get 10 torturous years of swimming lessons. And I eventually learning to dog-paddle five metres. (My parents took me to Surfers Paradise once, where I horrified them by half-drowning in the kiddie paddle pool at age 10. The lecture I got afterwards about public humiliation …) At lunchtimes, I was junk-food runner for a cool girl called Angela who had better things to do than queue at the canteen. She rewarded me with icy poles. Between handing over her cream buns and salt & vinegar chips and being told to rack off, Angela would scare me witless with tales about high school – they stuck your head in the toilets and flushed, they pinged your bra. Angela’s mum was a teacher, so she knew. I felt deeply ripped off because I didn’t have a slinky, click-clackers or a gonk. And I yearned for Space Food Sticks in my lunchbox. I wore an ABBA badge and thought Boney M and Doctor Hook (my Dad’s personal favourite) rocked. I was beside myself when The Bay City Rollers stayed at the same hotel as my family when we visited Sydney once. I glimpsed their tartan-clad legs through the crowd in the foyer. Much kudos in the playground on Monday. You have a very good memory! The things I remember most about third grade was getting punched in the stomach by a boy called Troy because he wanted to put his Kiss tape on in the class tape player but I was playing Abba, and our teacher forever having to leave the classroom in tears because she couldn’t cope with the naughty children. Third grade. Catholic school. I suspect she didn’t last long as a teacher. Gingers need to stick together. Especially in third class. Those third graders can be BRUTAL.